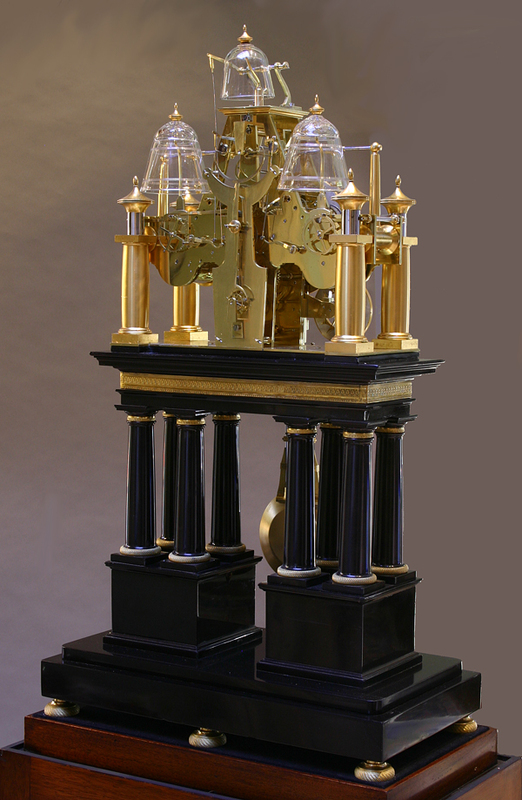 The massive architectural black marble case has eight Doric columns with decorative ormolu mounts, a chased freeze and six bun feet. 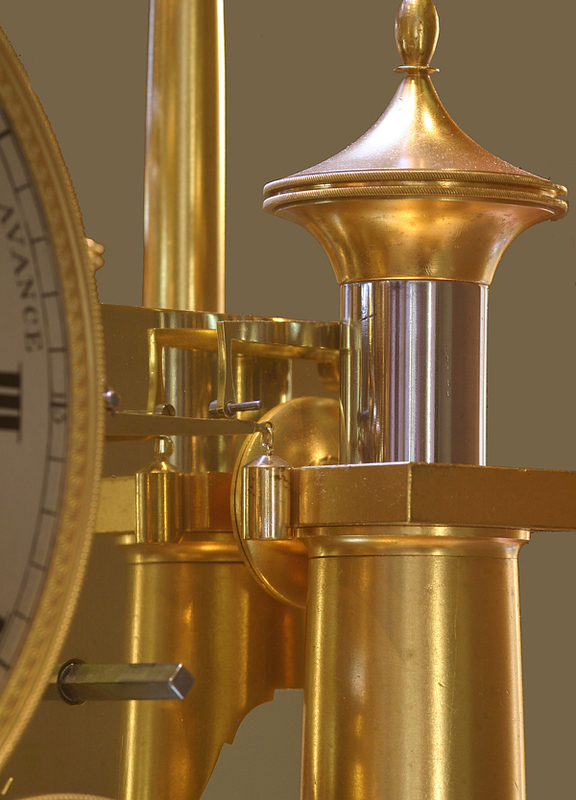 The engraved silvered hours chapter ring has Roman numerals for the hours, indications for the Equation of Time, ‘SOLEIL RETARDE, SOLEIL AVANCE’ and four steel-cut hands that include Breguet-style time hands, a sweep seconds hand and an indicator for Equation of Time that carries an ormolu sun. It is signed and dated by the maker, ‘Constantin Louis Detouche, Paris, 1842’. 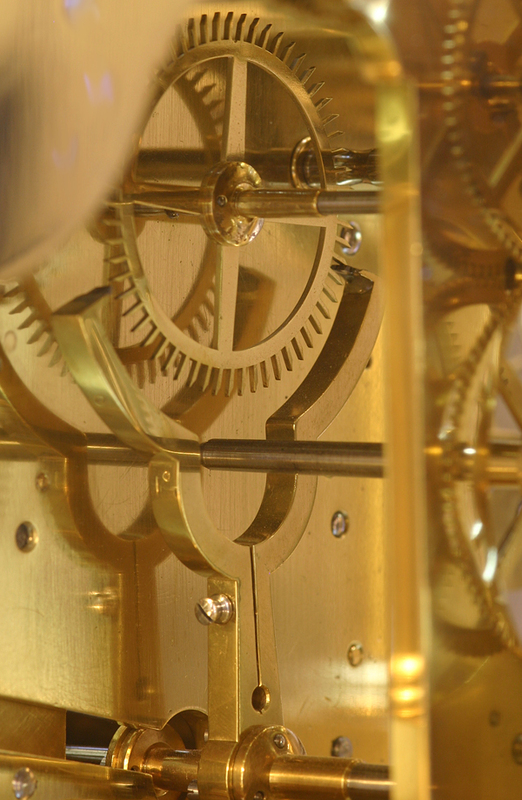 Flanking the hour dial are the engraved silvered calendar dials. 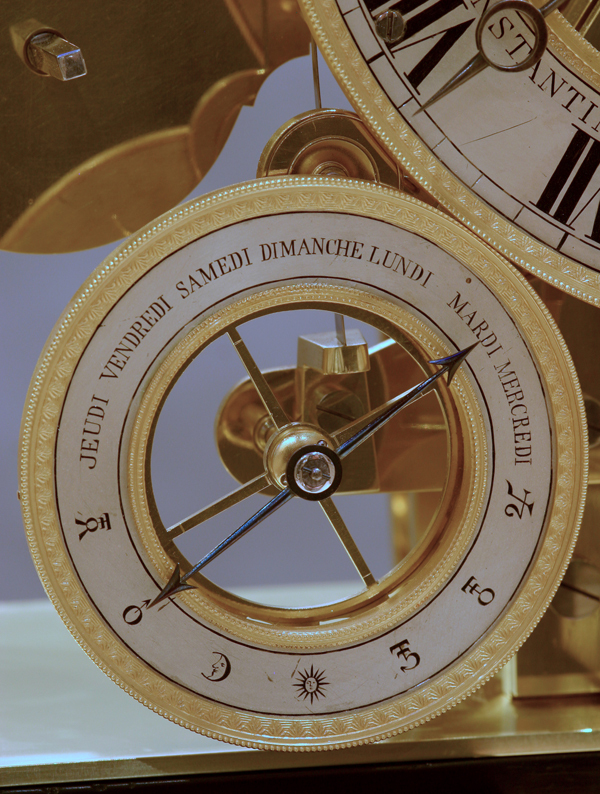 The day dial has a double sided steel hand that points to the days, in French, across the upper half and the zodiac signs along the lower half. 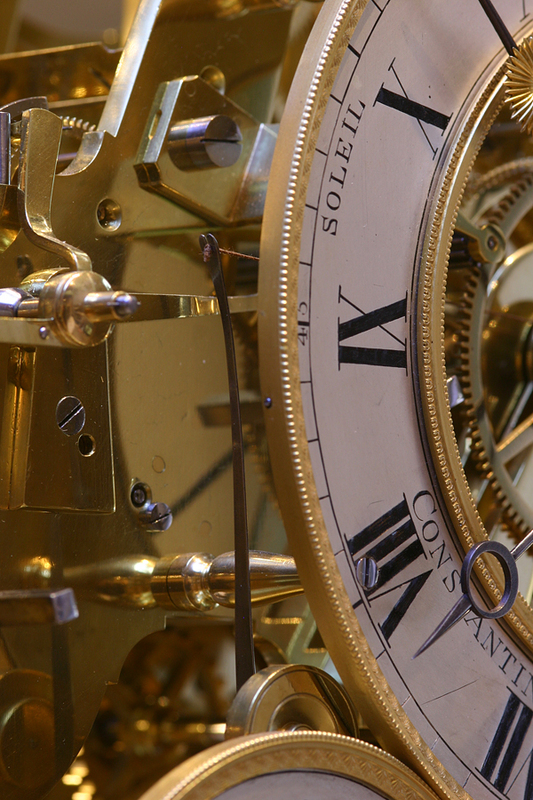 The day/date dial has two steel hands that indicate the month and the date on concentric chapters. 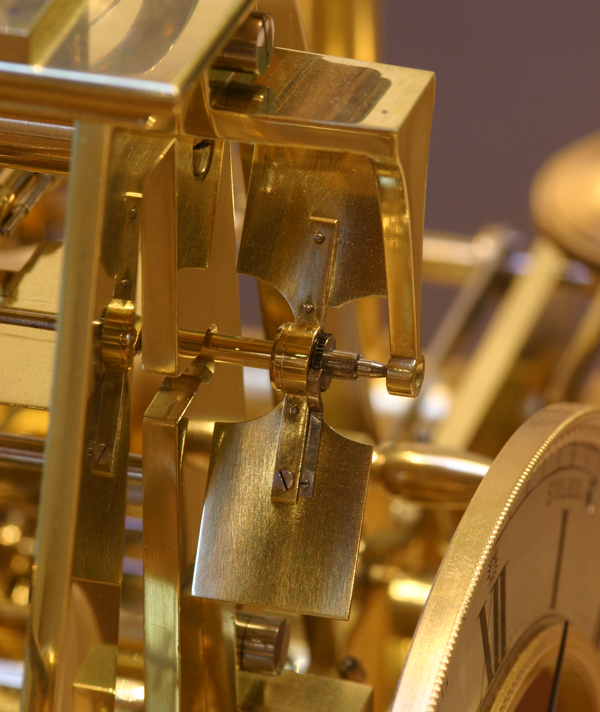 The massive eight-day quarter-striking skeleton movement has multiple thick plates, massive shaped ormolu posts, finely-spoked wheelwork with screwed collets and is supported by four large ormolu columns with knurled ormolu and steel finials. 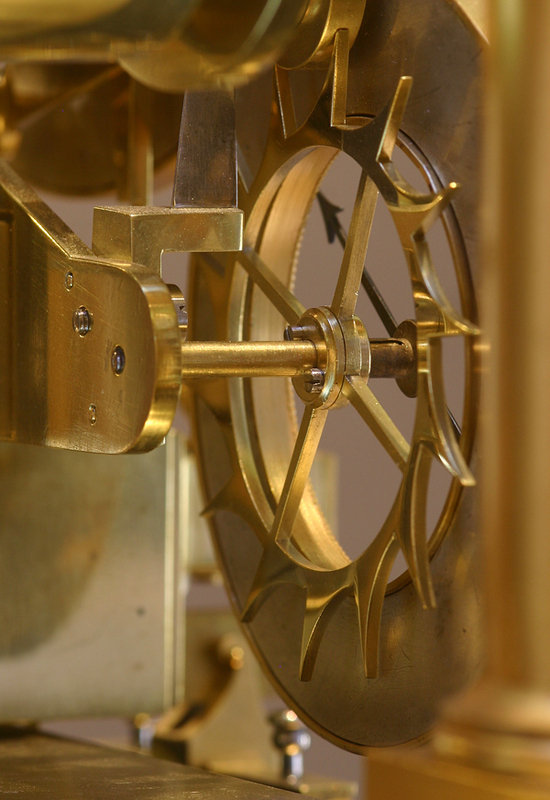 The spring-driven strike trains are activated by long levers with brass counter weights, have separate countwheels and have ormolu hammers mounted to steel shafts that are rotated vertically to strike the quarters and hours on three glass bells, each with a different tone. 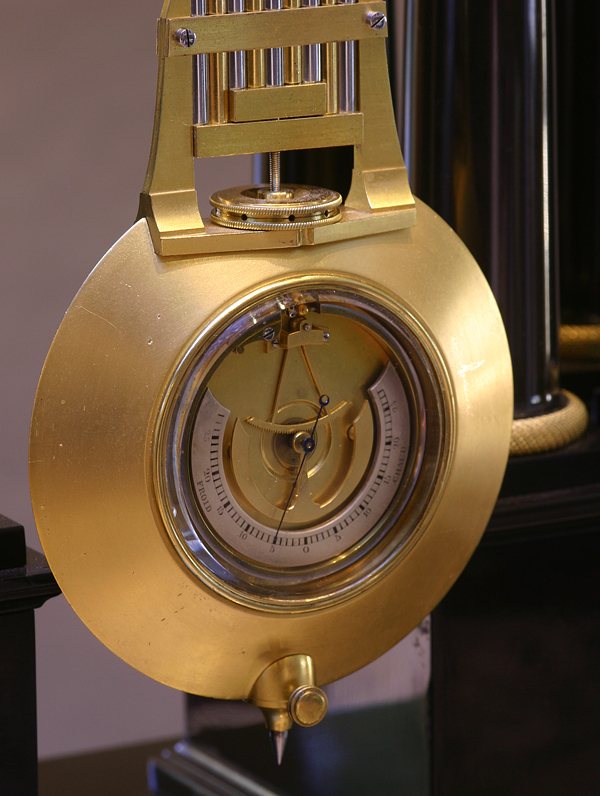 Double strikes announce all four quarters while at the hour the third bell is incorporated to strike the appropriate hour. 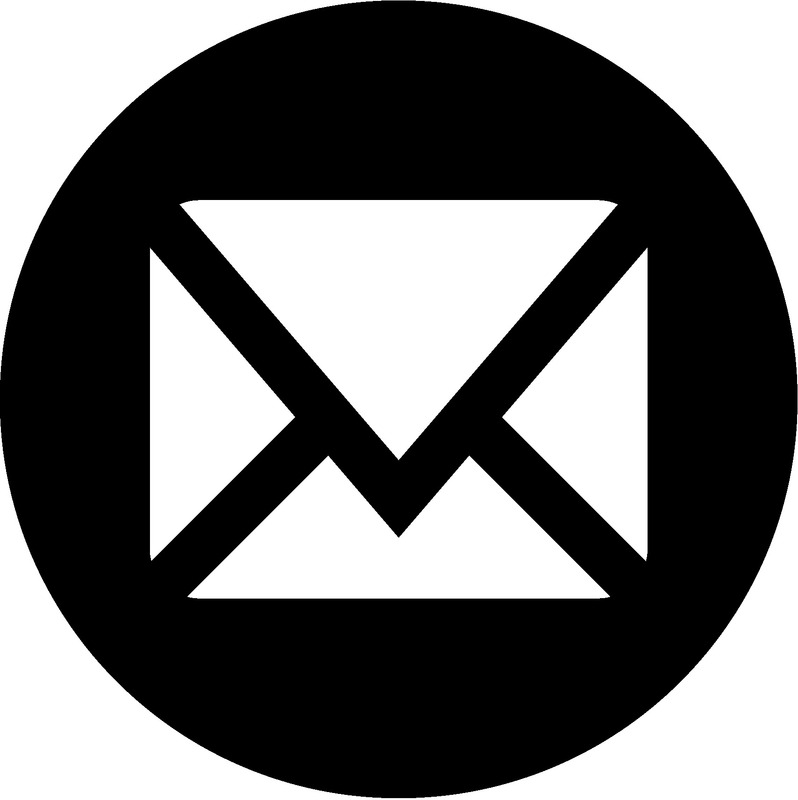 On the back most plate is a vertically mounted y-shaped lever with screwed steel points at the top and a steel pallet below. 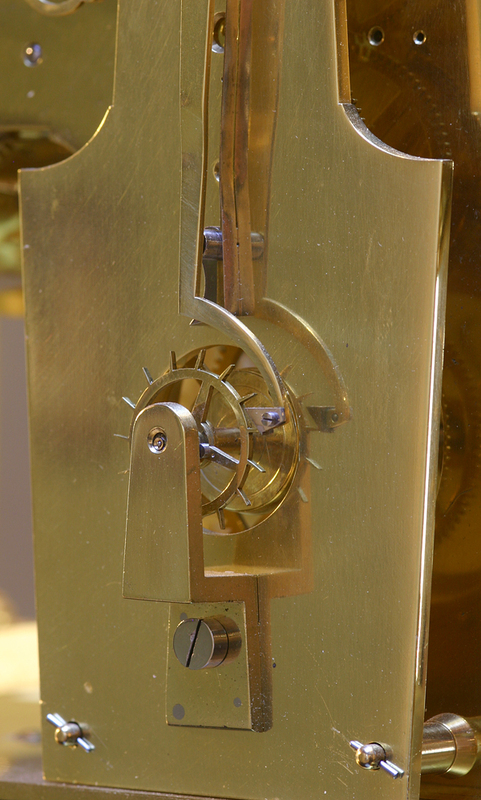 The points engage a fan assembly made up of three separate fans all carried on the same arbor with the front most fan ratcheted. 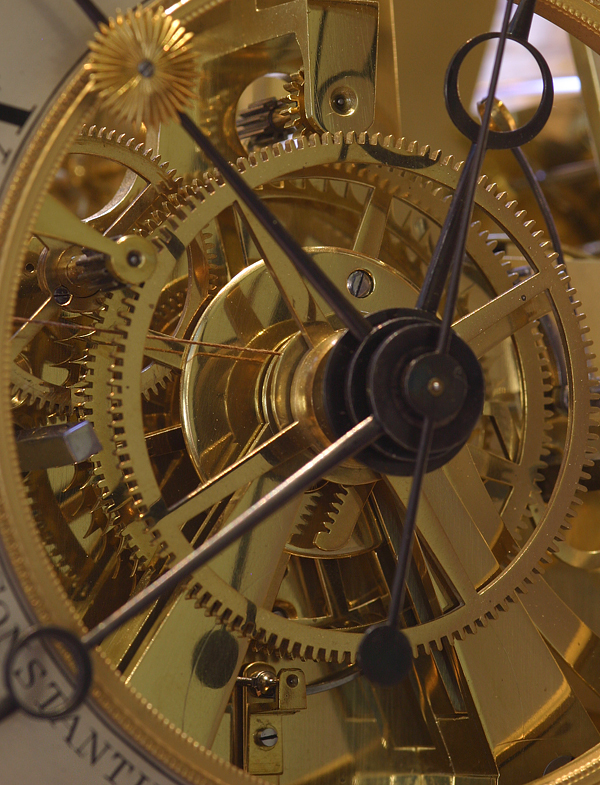 The steel pallet rests against a sixteen-tooth wheel that shares the remontoire arbor. Every 40 seconds the wheel pushes the steel pallet over enough to allow the fans to rotate 180 degrees and in doing so cause two things to happen. 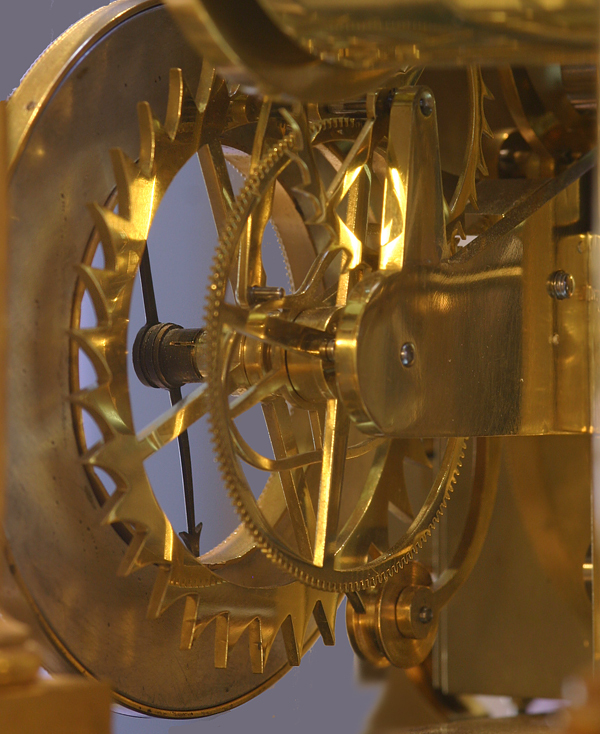 The first is the small remontoire spring is rewound via a series of wheels that run up the back of the movement from the two large barrels bellow and the second is the minute and hour hands jump 40 seconds. In this way the hands are isolated from the going train and have minimal engagement. 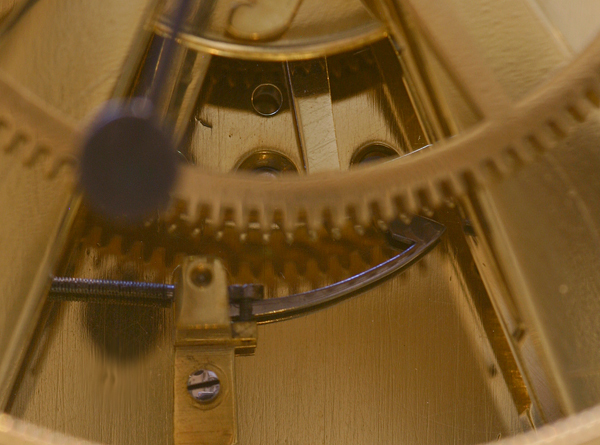 The sweep seconds bit is activated by a coup-perdu so the half-second pendulum shows seconds on the dial. It is, however not part of the escapement thus making it independent of the rest of the going train. There is a second adjustable crutch off of the anchor arbor with a pivoted detent that engages the 60-tooth seconds wheel at the bottom and drags it over one second every other swing of the pendulum. Up at the top sits an adjustable weighted steel positioning arm that locks it in place between swings. 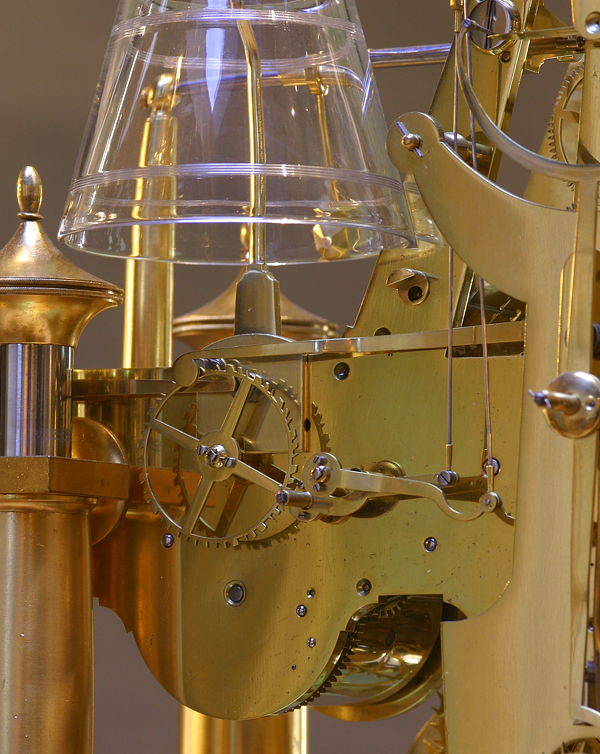 The heavy compensating nine-rod pendulum has a screwed beat-adjustment on the crutch, a glazed lenticular bob that contains a compensation scale and is suspended by a steel spring from a substantial block that is mounted to the front plate and has a knurled screw to adjust fast/slow. 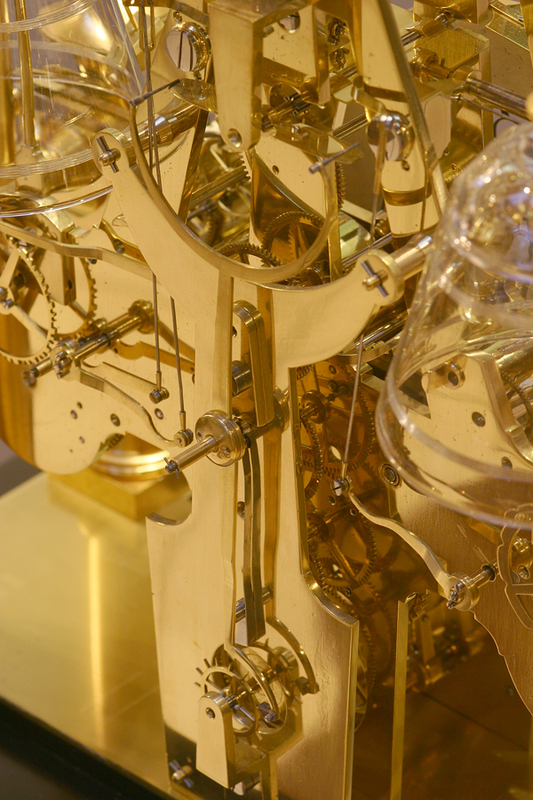 As the temperature changes the bimetallic curve moves the indicator hand via rack and snail against a silvered scale that has Arabic numbers and is labeled ‘froid’ and ‘chaud’. 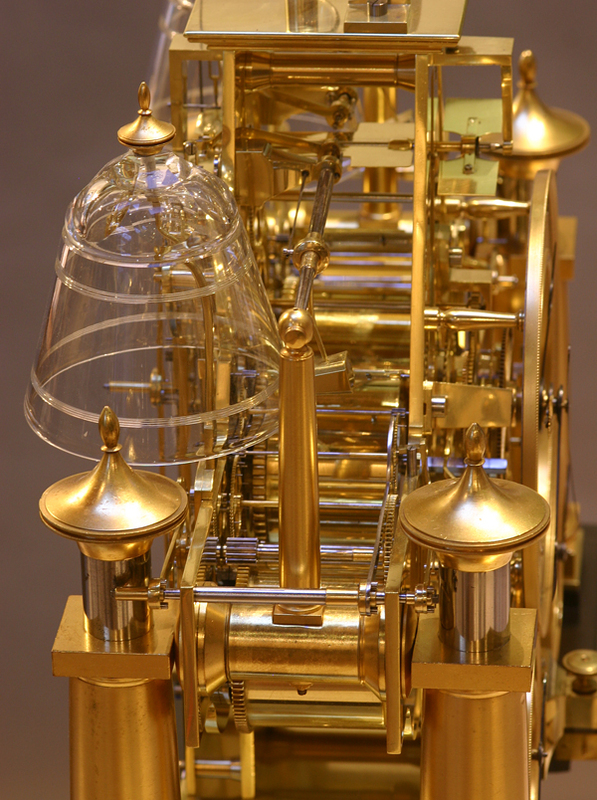 The finely cut equation of time kidney is mounted to the month wheel and moves the equation hand by a rack and pinion that is kept in position by a string held by a straight tension spring. The whole is contained in a purpose made glazed mahogany display case with lift out front and rear doors. 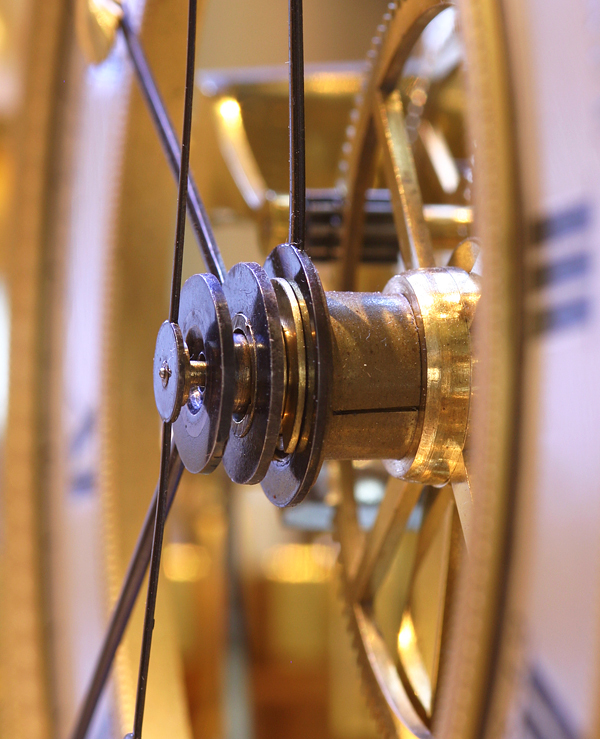 Constantin Louis Detouche (1810-1889) ran a very successful retail establishment supplying well-made domestic clocks, but was renowned for his few exhibition quality mechanical pieces and his early work on electrical horology and public clocks. 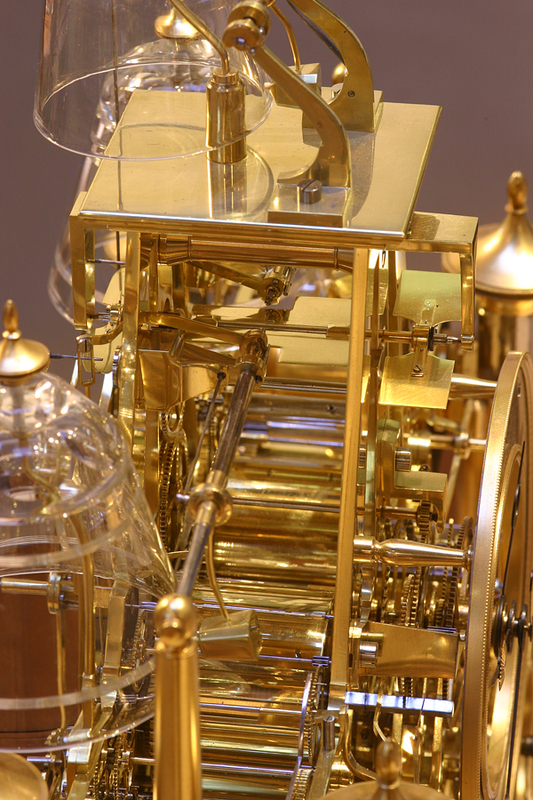 He held numerous patents and gained universal admiration for his mechanical genius and public service. 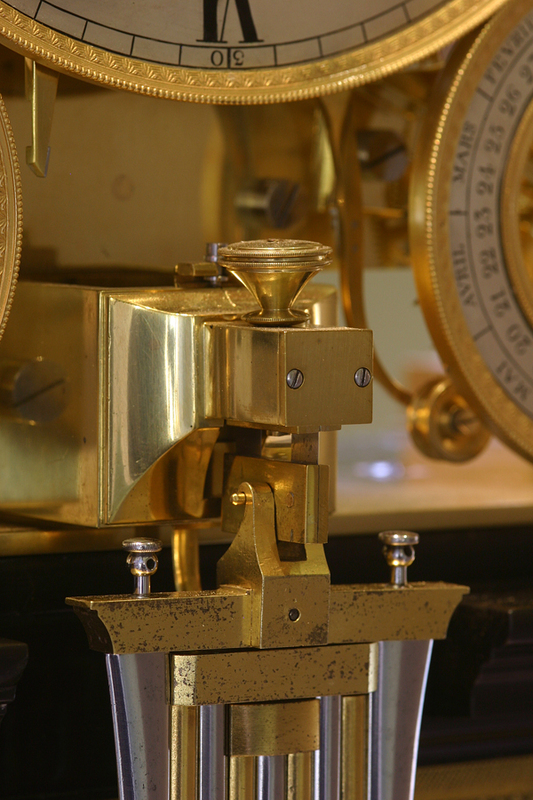 He is listed in Tardy’s as working at both Rue St. Martin and Rue de Venise and collaborated with some of the greatest horological minds including Robert-Houdin with whom he was awarded a Gold Medal for their contributions to the 1851 World Exhibition in London. 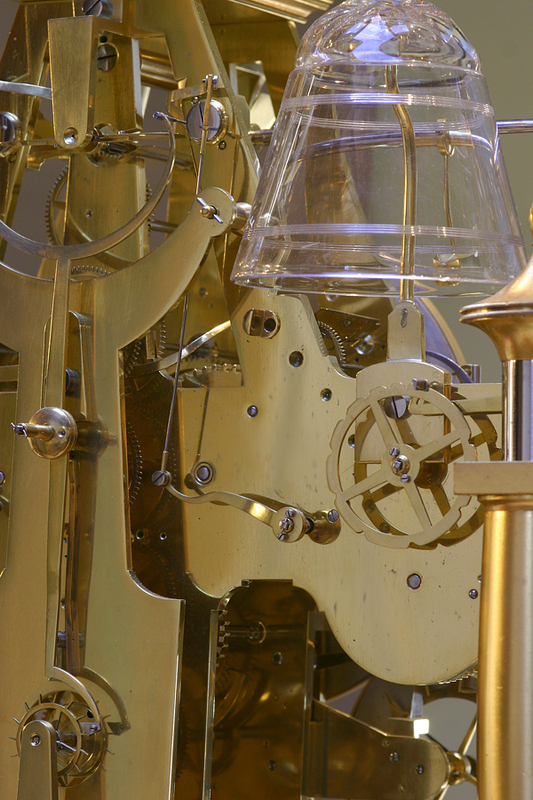 In 1855 he invented a turn-style that was used for the Universal Exhibitions of 1855 and 1867. 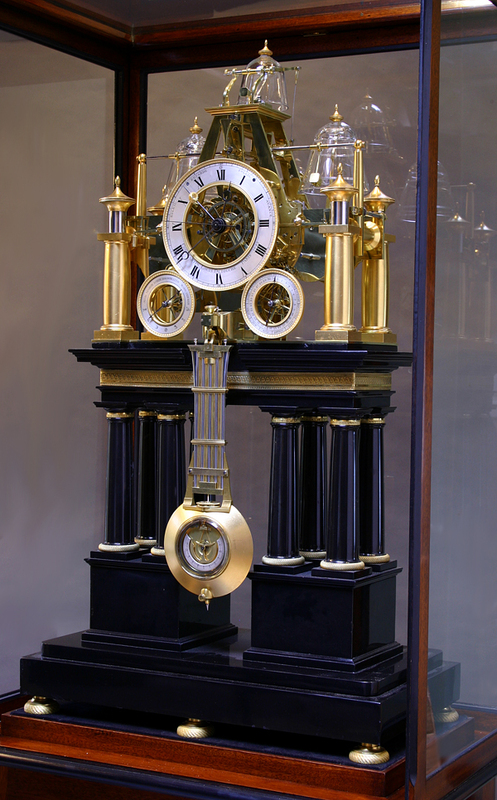 In 1857 he was awarded a silver medal by the Société d’Encouragement for repeating strike work for public clocks and also a gold medal at the 1860 Universal Horological Exhibition. 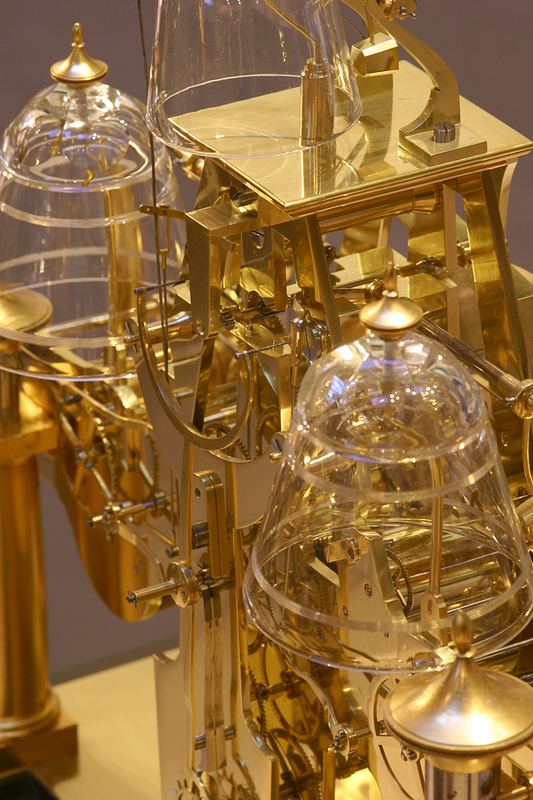 He took an early interest in electric horology and in 1851 patented an electromagnetic clock. 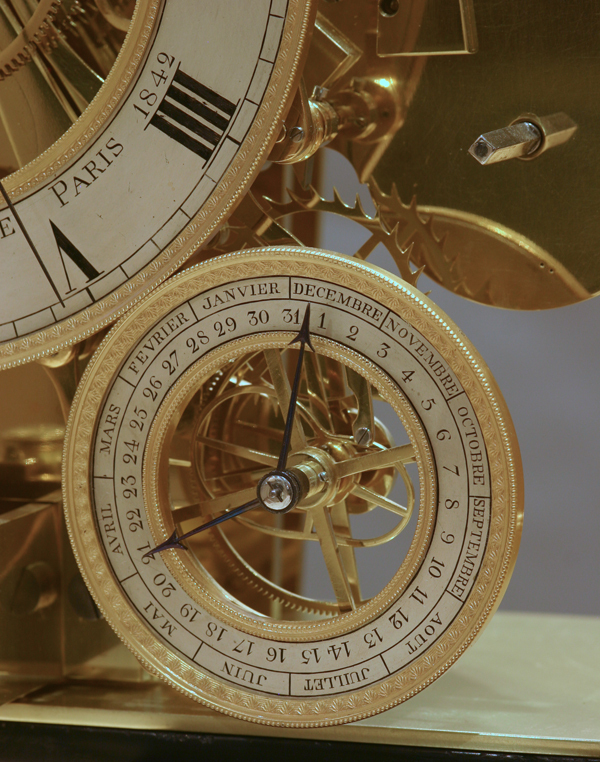 Royer-Collard notes that Detouche was ‘well known in clock-making circles because he was responsible for editing the second edition of Sauniers Treatise, a renowned book of instruction’. Publicly minded, he was honored by France as a Knight of the Legion of Honor in 1853 and became mayor of Villemomble in 1871 where he improved the basic infrastructure including the roads and the water supply. He became a first magistrate in 1879 and died in 1889. He was buried in the family tomb in the old cemetery in Villemomble. 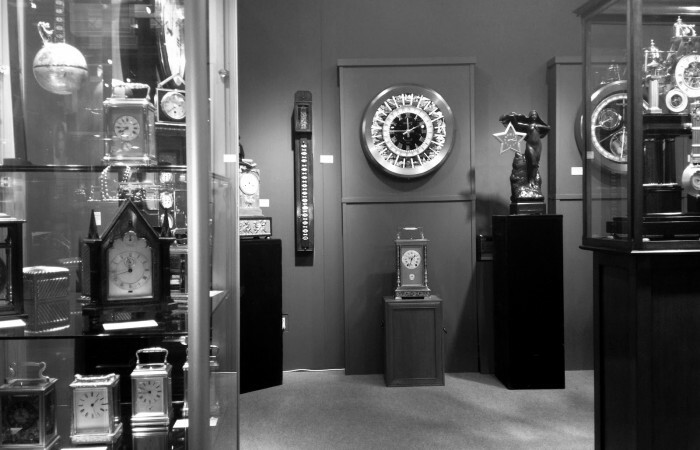 Christies, London, ‘Magnificent Clocks’, Sept. 15, 2004. Sotheby’s, London, Sept. 28-29, 1995, Cover Lot # 350.